Raksha Bandhan, also known as Rakhi Festival, is one of the most popular festivals in India which celebrate sister-brother relationship. Raksha Bandhan 2019 date is on August 15 in most calendars in India. On this day, the sister ties ‘Rakhi’ on her brother and who pledge to protect her from any danger. Raksha Bandhan, also known as Rakhi Festival, falls on the full moon day in Shravan month (Shravan Purnima). Earlier, Raksha Bandhan was mainly celebrated in North India. Today, the ritual is observed in all parts of India. 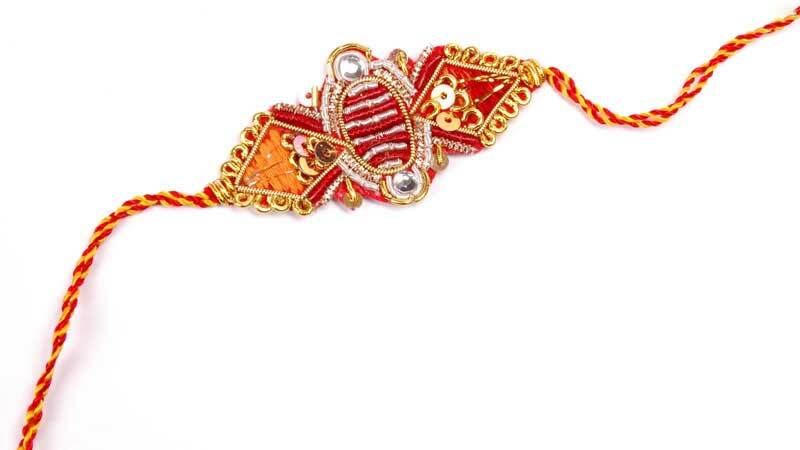 The simple threads of Rakhi symbolize the sacred love of brother and sister. There are several reasons for celebrating Raksha Bandhan and it is a mixture of both religion and social custom. On the Raksha Bandhan day, sister prepares the puja thali with a diya, uncooked rice, roli and rakhi. She worships Ganesha, and then the deities worshipped in the family. Shen then ties rakhi to her brother (on the right hand) and prays for his well-being. In return the brother promises to protect her sister and gives her a gift (a sweet). Brother and sister then share and eat sweets. How to arrange Raksha Bandhan Rakhi Plate?